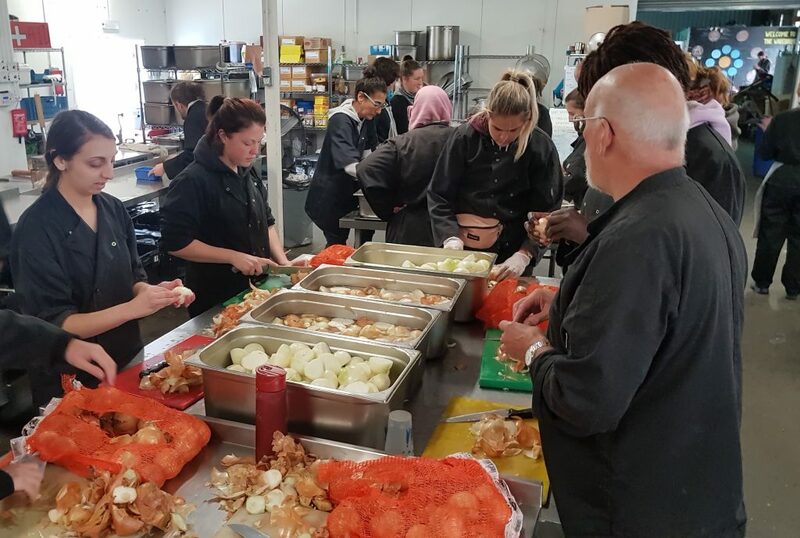 In the latest blog in our series on creating a welcoming environment, Bethan writes about her experience of spending a week in Calais with a group from St Ethelburga’s Centre for Peace and Reconciliation, working with the organisations Help Refugees and Refugee Community Kitchen. In recent weeks, the migrant crisis in northern France has caught the attention of the media once again, after a number of migrants successfully made the channel crossing from Northern France to the English coast. According to BBC reports, it is estimated that over 220 people have attempted the sea channel crossing since November 2018. However, since the destruction of the Calais Jungle in 2016, significantly less attention has been paid to the migrant population in who remain in Northern France. At its height, the Calais Jungle was home to around ten thousand people, Upon the destruction of the camp, those who remained were forced to collect in smaller, more informal camps. Approximately 2000 people currently live in the forests and on the streets of Northern France in Calais and Dunkirk. It is these people that Help Refugees and Refugee Community Kitchen are supporting. Often, the migrant crisis has been presented in a very simplistic way in much of the media. Those seeking a better life in Europe or Britain are characterised as a homogenous group of dangerous foreigners, a ‘swarm’ set on coming into the UK to disrupt our way of life. The term ‘illegal immigrant’ gives the impression that a person’s whole existence is criminal. This is especially dangerous when such stereotyping works its way into political discourse and decision making. While ideally political decisions should be made with knowledge of the true complexity of issues, when overly simplistic language is used it can limit the capacity for policy makers to comprehend the nuances of a situation. Such categorisation does not always start with an intention of cruelty – rather, reducing people to numbers, labels and stereotypes gives us the semblance of understanding in an increasingly complex world. However, in limiting our depictions of migrants and asylum seekers to easy stereotypes we do them, and ourselves, a significant disservice. Over-simplification makes empathetic connection much more difficult. It makes it harder to recognise our common humanity, to the extent that it is only when we learn of the horrific, if that be of the drowning of hundreds in boats in an attempt to cross into Europe, or the now infamous image of a small boy’s body washed up on a meditation beach, that we can finally make the human, empathetic, connection with those involved. Resorting to stereotypes means we can fail to see the true complexity of the people at the centre of this issue. For, as I experienced in Calais, these people are not only their labels of ‘migrant’ or ‘refugee’, but so much more. If that be football fanatics, bibliophiles, animal lovers, art and music enthusiasts or fans of film and television. Like the rest of us, their lives and experiences are complex, and this complexity is something we should embrace rather than attempt to simplify. The people I encountered in Calais, however briefly, were not a homogeneous group. Quite on the contrary, they were diverse in many ways, from ethnicity to personality. Help Refugees and Refugee Community Kitchen do a fantastic job of not limiting the people they support by labels and categorisation, serving all regardless of who they are. Since 2015, Refugee Community Kitchen, staffed entirely by volunteers, has prepared, cooked and distributed over 2.5 million hot meals, seven days a week. Their desire to serve without judgement was something I found to be very powerful during my visit: by focussing on ‘the people we support’ instead of labels and classifications, all are welcomed. The command to love our neighbour is not an easy one, but one I feel is reflected here. To love someone is to understand and believe that they are more than the labels by which society defines them. It is the understanding that other people’s experiences are as valid and real as your own. We understand that the people we love are ‘more’, that they transcend the simplicity through which we see the majority of the world. I believe that in attempting to love as Jesus loved, we must challenge ourselves to embrace the complexity of the lives and experiences of everyone, not just those we know. When Jesus met the Samaritan woman at the well (John 4:1-42), Jesus embraced the complexity of her life, he did not use her experience to shame or condemn her. Rather, he opened a relationship with her and used her experiences to spread the Good News. To love people is to understand their complexity and love not in spite of it, but because of it. The question that remains is: where to start? The idea of trying to see people in all their complexity can be applied to all areas of life. In regards to the situation in Calais, I suggest that we start with attempting to appreciate that those 220 migrants who crossed the channel have minds and lives are as complicated as our own. This will not solve the problems at hand, but it is a vital step in giving validity to the stories of the most vulnerable. This is one of a series of blogs looking at how we can be part of creating a welcoming environment for migrants. Read the others here. The post The Power of Seeing People Complexly: reflections after visiting Calais appeared first on Joint Public Issues Team.